If you own a 4×4 and feel it’s time to put it through its paces, you’re going to want to go off road. And whether you decide to do this alone, or as part of an organized event, when you’re just starting out there are a few essential driving tips you should aim to remember. Pay attention to these will hopefully keep you on all four wheels, (the right way up). While the speed demons out there may groan at the sound of such caution, the fact is a lot of off road terrain calls for a slower speed; especially if you are a beginner or completely new to the environment. If you drive too fast you will not be able to react when that large fallen tree or boulder suddenly appears in your path. Furthermore, unless you are part of a race, one of the reasons to go off road in the first place is to enjoy the wild and untouched scenery. How can you do that if you’re bombing across the landscape like Mad Max? With that being said about the scenery, to really take it all in is the reserve for pit stops or when cruising on easy terrain without obstacles. The fact is, the majority of off road driving calls for maximum attention on the road ahead. If you’re holding up your iPhone to snap the landscape, your 4×4 off road experience is likely to end rather quickly. Those aforementioned logs, ditches and boulders will sooner or later get the better of you. If you don’t want your chassis ripped to shreds, you’re going to want to have your eyes on the road. While it may not be possible to know exactly what your vehicle can handle until you take it off road, you will know from what the manufacturers have to say, which terrains are off limits. It goes without saying that you will want a full tank of gas and all other fluids in place before you set off. However, do not get complacent. Keep an eye on your readouts so that you don’t receive any surprises. An over heated engine in the middle of nowhere is never fun. Don’t be afraid to stop the vehicle if you see an obstacle up ahead. You are a beginner after all, and besides, there’s no one out there watching. It will make a big difference to get out and take a proper look at what’s in your path, before you attempt to ride over or around it with your trusty off-roader. There may be some hidden surprises after the obstacle, or it might just be that taking a different path is the only option. Whatever happens, when you get back in the vehicle to take the obstacle on, you will be a whole lot more informed. Safety should be paramount. If you do decide to drive through the obstacle, make sure you do not change gear half way through. It is an important skill of off road driving to select the correct gear before you make the traverse. A ditch of water provides a good example. If you shift gears while in the middle, you will loose power and speed the moment you press down on the clutch. Then, after shifting into the new gear, it is likely your wheels will begin to skid. Both of these outcomes are detrimental to you and your vehicle cleanly making it through the obstacle. Instead, a smooth and steady combination of engine force and vehicle speed should be taken as you proceed through the ditch. Following on from that last paragraph above. Not only should you remain in the same gear throughout the obstacle, (by choosing the correct one before you start) your RPMs should also be steady and low. Sure, you may have to apply more to traverse up a steep gradient, but the application should be measured, not as if you’re gunning the engine in panic and scaring off all the surrounding wildlife. In general, low RPM’s will provide greater torque. When driving in off road areas you should opt for a low gear to drive at the optimal speed. Hang out in off road circles for any time at all and you will hear drivers mentioning the ‘line’. What this basically means is the ‘line’ or path you will take as you drive through a terrain and over or around obstacles. When choosing your ‘line’ you are thinking about more than what’s ahead of you. You are also taking into consideration the capabilities of your vehicle, plus potential damage that could be done to your undercarriage (i.e exhaust, suspension, drive shafts, petrol tank etc). A skill that you should acquire as a good off road driver will see you imagining the line before you try it. This will help you plan your way through obstacles while avoiding damage and maintaining your momentum. (However, as we state above; as a beginner you should not be afraid to stop the vehicle if necessary. This will give you the time you need to visualise the ‘line’ without causing undue damage to your vehicle). A schoolboy error the most newbie off road drivers make is to hold their thumbs on the inside of the steering wheel. 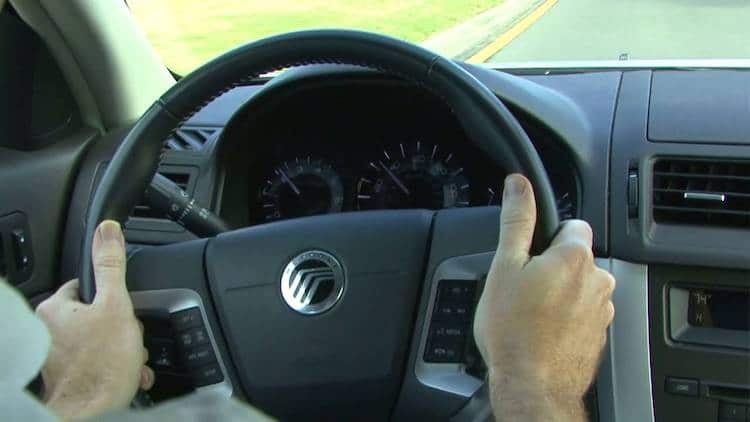 Quite simple, if any of the front wheels gets stuck on an obstacle, the steering wheel is likely to flick out of your control, “turning” your thumbs in a new direction as a result. Believe me, you do not want to experience that. The best way to hold the steering wheel is with your thumbs in line with the wheel, (as shown in the image above). There are two ways of reducing your speed when you are driving with a manual transmission. The first is obviously applying the break pedal. The second method is to select a low gear (1st or 2nd) and let the clutch out. Without your foot on the gas, the engine gear ratio will do the breaking for you. The benefit of engine braking is that you are able to control the wheels at a fixed rate of spin. This in turn helps maintain traction when on a descent, as well as better control around corners. This is different to using wheel breaks to slow your vehicle. Here you risk applying too much stopping force that can result in the wheel locking up and losing traction. Most off road drivers in manual transmission vehicles will use a combination of engine and wheel breaking for maximum control and safety. Related Content: What are the best Luk clutch kits you can buy? When pulling away in snow, you should opt for the highest practical gear you can drive in from a standstill. If your vehicle has them, ensure that the differential is locked and any electronic traction systems are engaged – you want every thing you can to be on your side in such demanding terrain. Once on the road, you need to be extra vigilant for what obstacles may be hidden beneath the snow. Here a combination of many of the above points come into play. You need to drive slowly, with maximum attention on the path ahead. At the same time, you will need to keep your momentum up in order not to loose traction with the road.